Twelve year old West Virginia squirrel hunter. Growing up in West Virginia in the 50’s I was constantly in the woods looking for adventure. 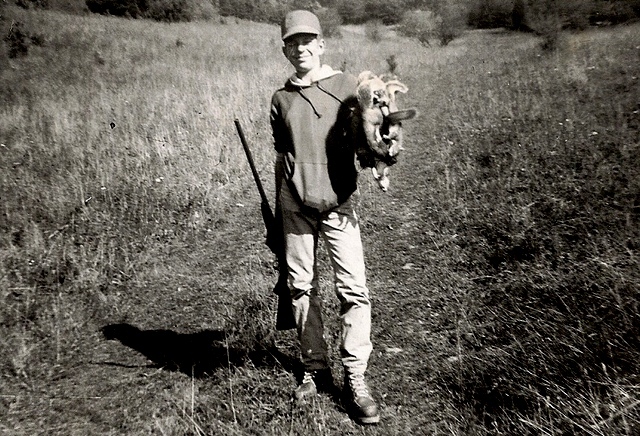 I loved hunting rabbits and squirrels but when it came to whitetail deer, they were no place to be found. I had never seen a deer during deer season before I joined the Air Force. I would get a glance of one occasionally when hunting small game but that was rare. I had heard stories about good deer hunting in PA but not in southern WV. While I was stationed at Perrin AFB, TX in 1964, I went deer hunting one time with my supervisor but didn’t see a deer. However, I did see a red wolf which was not that common in northern TX and I shot a bobcat but no deer. Fast forward five years to when I was stationed at Langley AFB, Virginia. I hunted with a friend, again only one day and no deer. On Thanksgiving weekend, my brother-in-law, Larry Buchanan invited me to join his family at their deer camp in WV. There were 17 hunters hunting out of that camp during those four days and only one spike buck was harvested. And much to my dismay, I didn’t see a single deer. When I was assigned to Elmendorf AFB and found out they didn’t have whitetail deer in Alaska, it was no big deal. I did find out later that there were black tailed deer on some of the islands but with all the different species that I could hunt in Alaska deer was no longer important to me. During the early 90’s as an owner of AAA Alaskan Outfitters I attended the West Virginia Hunt Show to book hunters. The show sponsored a Big Buck contest and it was amazing to see the size of the whitetails that were coming out of WV then. In talking with my uncles that I used to hunt with, they all told me it was like a different world with deer everywhere even in the old spots that I used to hunt. That was a great comeback for sure. I read on the WV DNR site that the whitetail deer population peaked in the mid-90’s. In 1985 at the Foundation for North American Wild Sheep convention I met Dan Artery, an Outfitter from WY. He told me that he had hunted once in Alaska and really wanted to return and asked if I was interested in trading hunts. I told him that we were just getting started and I couldn’t afford to at that time but maybe later I would be able to work something like that out. Ten years later we came to an agreement using our printed pricelist. I traded him a brown bear hunt in our Western Alaska area for an elk, mule deer, antelope and whitetail deer hunts in WY. That was an across the board even trade. Since I had to be drawn for all of the WY species it took me several years to complete my hunts. The river bottom country in Wyoming. I was drawn for elk and mule deer in ’96 and harvested a beautiful 5x5 mule deer. Dan took a beautiful 8’blond brown bear in ’97 the same year that I got drawn for whitetail. We hunted out of Wheatland, WY, where Dan lived. Dan picked me up early every morning at a local motel and we drove south to a couple of ranches where Dan had leased the hunting rights. We rode around in his truck most of the day checking out the river bottoms that ran through the ranches. A whitetail doe in one of the river bottoms. On day two we had a light two inch snow. Dan had another hunter join us who was looking for a trophy mule deer. Right at sunrise we spotted a group of whitetails lying under a grove of trees. There was a really nice buck in the group. It was fairly open country with no way to approach so Dan dropped me off to get set up and he and the other hunter drove past the deer, parked, got out and tried to drive the deer to me. The deer didn’t cooperate and ran out the opposite side of the creek bottom. Dan drove back to pick me up and told me he thought he knew where they might exit. So we drove off the ranch to a small main road and spotted them coming out of the river bottom. I jumped out of the truck, went under the fence and got set up for a shot. It was around 175 yards when the buck stopped and the 180 grain Nosler Partition bullet from my old .300 Winchester Magnum put him down. I ran over to where he dropped and Dan found an access gate a couple hundred yards down the road that allowed him to get the truck over next to the deer. It was a beautiful 10 pointer with really high points. It wasn’t heavy or wide but it gross scored 151. I was super pleased that I had taken such a good buck and decided that was probably going to be my first and last whitetail. I was good with that. My first whitetail deer taken in Wyoming. A 151 B&C ten pointer. Dan Artery and me with my deer. Great hunt! It’s now July 2017 and my wife and I were driving back from our cabin on the Kenai when she asked, “What can I get you for your birthday?” As always I said nothing, that I didn’t need anything. She suggested that I call Matt to see if I could go down and hunt deer on his farm. She was talking about Matt Caldwell, from Illinois. Matt was a good friend and client of AAA’s, hunting with us nine times. He had called me on numerous occasions inviting me to come down and hunt whitetails with him. I always declined because we charged him “Big bucks” to hunt with us and he was offering a free hunt. He would always say, “That is the way you make your living and this is just where I live.” Matt has hunted all over the world. He is also an avid whitetail hunter who harvested two B&C Record Book whitetails in one year and many more close to book. He has been hunting on his properties for 52 years. I told her that it would be weird to just give him a call and invite myself on a hunt. Besides he had told me that I could get an across the counter deer bow tag real easy. I hadn’t shot my bow regularly for 30 or 40 years and in addition, I had some disc problems that would keep me from using my bow. I told her I would need to get me a crossbow. She said, “That’s it, I will get you a crossbow for your birthday.” I said, “Well I don’t know which one.” I figured I could check with Brent as he had been hunting deer with a crossbow for several years in two or three different states. It was settled I was to get a crossbow of my choice and then call Matt to see if his invitation was still open. Brent told me he had a Ten Point Stealth FX4 crossbow and that it was a good one but expensive. I checked with Cabela’s and they had them for $1,298. To me, that was too expensive so I decided to wait and see if they went on sale. I think it was in October when that model did go on sale for $849. I jumped on that deal. I gave Matt a call close to the end of November and asked how deer season was going. He said fine but he hadn’t seen the buck he wanted to shoot. I said, “I was wondering if the offer to come down and go deer hunting was still open.” He said, “This year?” Laughingly I told him no but maybe next year. He said, “Next year would work great, I can’t wait to start planning.” He has told me more than once that the fun part of any hunt is the planning stage. I told him that I had bought a crossbow and since I was over 65 I could use that during bow season. He said to come anytime during the last week of October and the first week of November. That was a great time for me and was also the time I always recommended hunting the Sitka black tailed deer. Everything was tentatively set. We talked, texted and emailed numerous times before the hunt took place. A Redneck deer blind like the one Matt has. The only way to hunt. It was crazy that Matt and I had planned a deer hunt the year before and now while he is hunting brown bear we were talking about my up-coming deer hunt. During the summer Matt consistently kept me informed about the status of the food plots and about his new deer blind, the Redneck deer blind. It was the Cadillac of deer blinds. Matt seemed to be getting as excited as I was about the fall hunt. When I arrived on October 28th, Matt picked me up at the Moline IL Airport and we were on our way to Mt. Carroll. As we were driving I could see what Matt had previously told me about how flat the area was and why they called it corn country. I was just shocked how rural the area was. Once we arrived at Mt. Carroll the terrain changed to rolling hills with lots of trees. I love how their home was set in the trees overlooking a quiet little lake. Matt and his wife Heather made me feel right at home. I had met Heather in Anchorage about five years before while Matt, Heather and her sister were visiting Alaska. Looking at a doe out of the window of the Redneck. We drove over to the redneck deer blind area, parked the truck and slipped in and up the fifteen foot ladder. It was the Cadillac of blinds for sure. That evening we had twenty or more deer around us including one nice 8 pointer plus twelve turkeys. I could have finished my hunt that afternoon if I was just looking for a deer. However, I had told Matt from the start that I was going to hold out for a B&C record book buck, a “Booner”. My standards were high, maybe too high for someone who hadn’t hunted whitetail with a bow before. That night we talked about what my chances were for taking a “Booner.” Kind of similar to taking a 10’ B&C brown bear. Patience and more patience is what it takes. I felt I was ready. One of the many groups of turkeys that I watched from the blind. The next morning Matt dropped me off at a pop-up blind close to their cabin which was a mile or so from their home. We got there in the dark and after he got me set-up, he took off. Right at 7:30 a fantastic buck appeared. He was a high, fairly heavy and wide 10 pointer with six inch long brow tines and a two inch kicker on his left G-2. I couldn’t believe it. My first buck of the day and I knew if he got close enough I was going to shoot him. He approached to 72 yards and then walked across an open field and into the woods that Matt calls “The Sanctuary.” He never knew I was there. Hopefully I would see him again. I sat there and got the shakes which had not happened for years. It was crazy that on my first real hunting day I had a buck that big, close to a “Booner,” that I was going to shoot. What a beautiful deer! I was stoked. Matt’s cabin. I love the setting. That was just the start. During the next six days Matt would drop me off in the dark, pick me up for lunch, drop me off again and pick me up after dark. What service! I passed on two 10+ pointers, at under 40 yards. Both were super nice deer and on day five I spotted the largest deer of the hunt at about 100 yards away in the trees chasing does. That was my one and only sighting of that guy. I saw close to forty different bucks. A beautiful fall day. I spotted the largest buck of the hunt back in the trees about 30 yards. On day six around 3:45 PM I had a buck come in and pass by a scrape and stop at 42 yards. He had a few stalks of corn in front of him then as he was moving out of the cornfield I had a side shot at 48 yards. Neither were good shots so I let him leave. He looked nice and heavy and was wide enough but wasn’t very high. At this point of the hunt I had decided I would shoot a good buck below the “Booner” status. About 30 minutes later he came back into the far end of the cornfield, which was 80+ yards. He moved back out and went behind the blind. In another 30 minutes he came back into the cornfield from my right at 48 yards. He took his time feeding some but mainly just looking ahead. 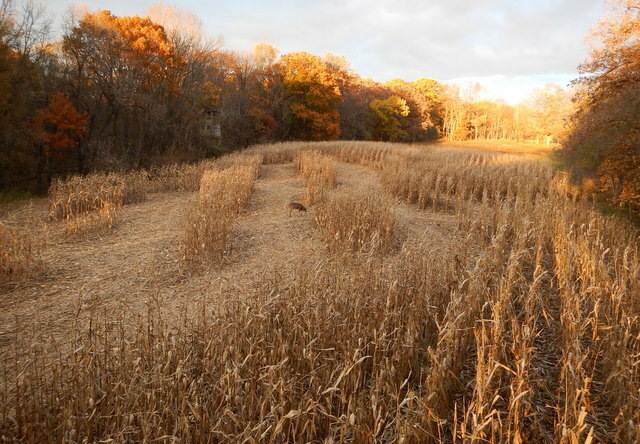 He went through a couple of more cornrows and stopped behind a row of corn at 34 yards. He then took two more steps into the open and stopped. His left leg was slightly forward and I placed the 30 yard red dot about five inches up and right behind the shoulder. I slowly moved the safety off and squeezed the trigger. He did a burst of speed and at ten yards shuttered but continued to run. He shuttered again and then ran into the cornfield. I knew it was a good shot. It was 4:51. I took my time packing up and closing down the blind. I found where he had gone into the corn and followed the blood, lots of it. He was down about 25 yards in the cornfield. What a beautiful deer. In WV we would call him a 13 pointer. In IL they call him a 10 pointer with stuff. I was a happy hunter. It was dark now as I walked down to get Matt. When he arrived I showed him a cell phone photo. He congratulated me and said I had a good buck. We took the 4 wheeler from the barn and loaded him up. About half way down the hill we gutted him. As I was pulling out his organs I found that his heart was sliced almost completely into. The Rage 2 blade “SlipCam” performed exactly as advertised. The bad thing was I had almost missed him. The arrow had passed completely through but an inch lower and I would have missed. Boy was I lucky. With the temperature cooling down fast we opened him up and left him on the back of the 4-wheeler in the barn. My heavy and wide 10 pointer with stuff (three extra points). A corn fed Illinois buck. A little different view. He scored 144 B&C. Matt with his two super bucks that he harvested after I left and the real Redneck blind. The next morning we caped him out and a friend of Matt’s came by and picked up the meat. 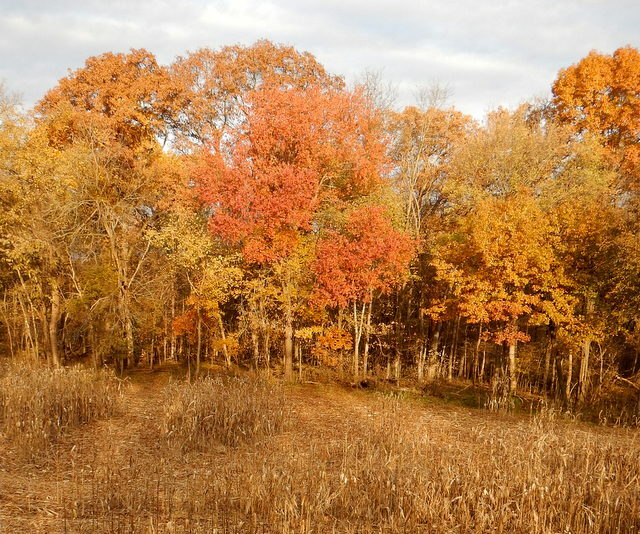 That afternoon I went back up to the redneck blind to hunt turkey. I used my rangefinder to check out where the deer had been standing and it was 36 yards. I thought he had stepped closer not further away. That is why I almost missed. I should have put the 40 yard dot on the bottom of his chest instead of the 30 yard dot 5 inch up. Knowing the exact yardage with those scopes are really critical. After seeing no turkeys Matt picked me up at dark. What a great hunt I had. Before I left home I told Karen that I was looking forward to taking a big deer and to the smell of farm country in the fall and seeing all the different birds and animals. I wasn’t disappointed. I got to see a bobcat, raccoons, opossums, a musk rat, numerous squirrels, turkeys, ring-necked pheasants, cardinals, blue jays, woodpeckers, crows and many other different birds. I participated as an observer of a true fox hunt with hounds and horses just like they did back in the day in Europe. Matt being a veterinarian in the area all of his adult life knew everyone and introduced me to so many nice people. I went on two emergency horse calls. I met some of Heather and Matt’s close friends who were really fun people. I got to visit with Shannon Schave who had hunted with AAA in the past and I got to see his impressive trophy room with many beautiful B&C Record book whitetail deer. Getting ready for the fox hunt. My beautiful deer mounted by Mike Meyer of Meyer Taxidermy Studio in Goose Lake, IA. What a blast! Great food and great company, I couldn’t have asked for more. Thanks Matt and Heather for being such wonderful hosts.